Match & lineup combination of: primary side load break switch & fuse, no-fuse disconnect, circuit breaker or magnetic conductor; feeding an isolation transformer that provides the optimal AC voltage to a Kinetics non-regulated, regulated or SCR motor drive rectifier. 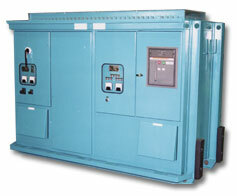 The DC output can be interfaced with a load break switch, main breaker and/or feeder breakers. Redundant diode, N-1, systems with annunciator systems are available. 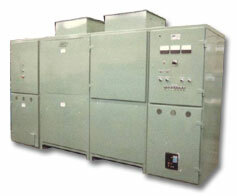 Free-standing steel or aluminum NEMA 1, 3R, or 12 enclosures are designed and fabricated at Kinetics’ Trenton, NJ plant to meet the demands of your DC substation’s operating environment. Enclosure optional features include: lifting eyes, sled base for pulling, thermo-stat controller strip heaters, high CFM air cooling system, heat exchanger cooling system, air filters and special paints & finishes.